Maximum size: 9 mm (Gosliner, et. al., 2008). Identification: This species has a cream body flecked with orange and white. Superficial wine-red pigment is often (though not always) present on the bases of the cerata. The rhinophores have two prominent folds near their tips giving them a zig-zag appearance. Natural history: Facelina sp. #2 is a moderately rare species found primarily in Halimeda kanaloana beds at depths of 6-20 m (20-66 ft). It lays a white, spiral egg mass with a ribbon only 1-3 eggs in width (around 0.2 mm) that hatches in about 3 days in the laboratory. Distribution: Maui, Oahu and Midway. Taxonomic notes: First recorded in Hawaii from Midway Atoll by Terry Gosliner and PF in June, 1993. 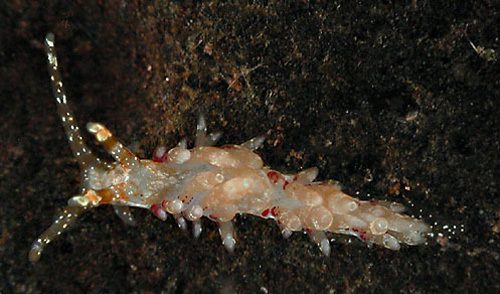 Photo: CP: 4.5 mm: found by PF; Airport Beach, Maui; April 13, 2006.